Some of the easiest Ikea hacks require no handyman skills whatsoever. All you really need to make a huge difference in your decor is a roll of removable wallpaper — and a steady scissor-wielding hand. And with so many fun patterns and colors to choose from thanks to the vast quantity of resellers, it's easy to put your own stylish stamp on pretty much any piece of furniture you haul home. These 11 Ikea hacks promise simple yet swoon-worthy transformations. 1. 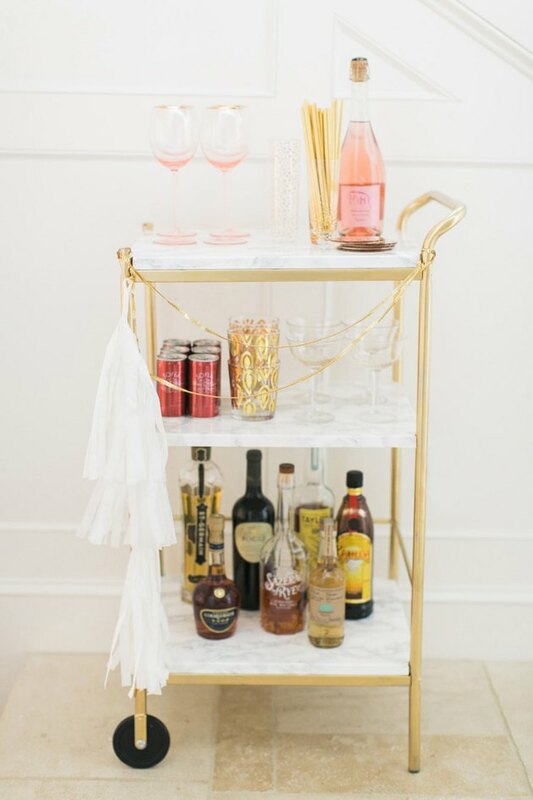 Turn the Sunnersta into a swanky bar cart. 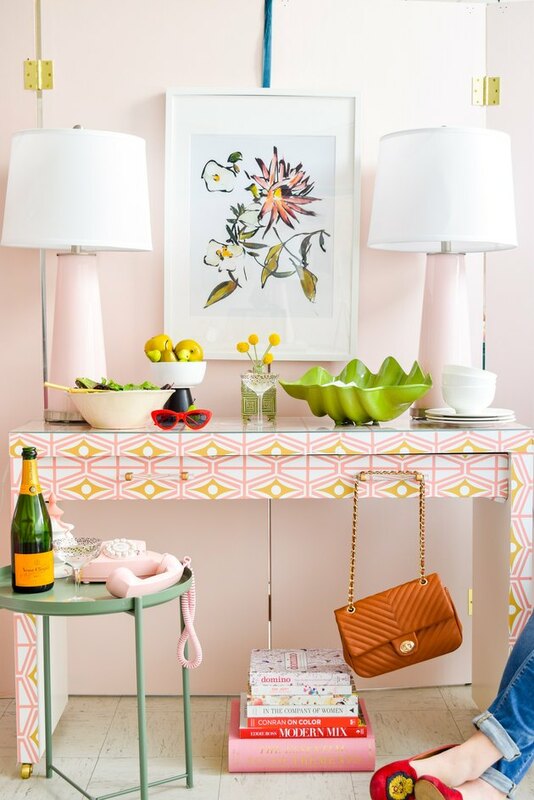 This clever hack from Style Me Pretty transforms a ho-hum, standard-issue Ikea bar cart into a beacon of glitz and glamour using only removable paper and gold spray paint. While the exact model used has been discontinued, Ikea's Sunnersta utility cart ( $29.99 ) serves as a worthy substitute. 2. Retrofit the Malm console table with a '70s-inspired print. This funky, psychedelic console table from Ariel over at PMQ for Two didn't always look so retro-chic. She used removable wallpaper from Spoonflower to give the Malm dressing table ( $169 ) its fun '70s-inspired effect. The pale-pink and mustard-yellow pattern will bring vintage style to your entryway. 3. Elevate your entryway cabinet with chic door fronts. Not interested in giving your black and white entryway a retro-inspired makeover? There's no shame in something more serious. Instead, transform a plain-Jane storage cabinet with some moody wallpaper for a dramatic effect. Anne Sage upgraded this Ikea storage unit with a theatric, dark floral removable wallpaper from Canvas on Demand. 4. 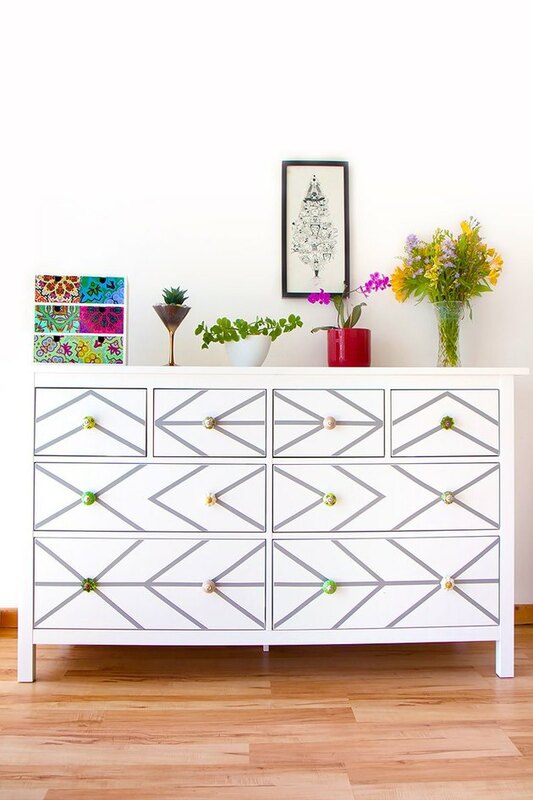 Infuse your Hemnes dresser with some geometric pizzazz. 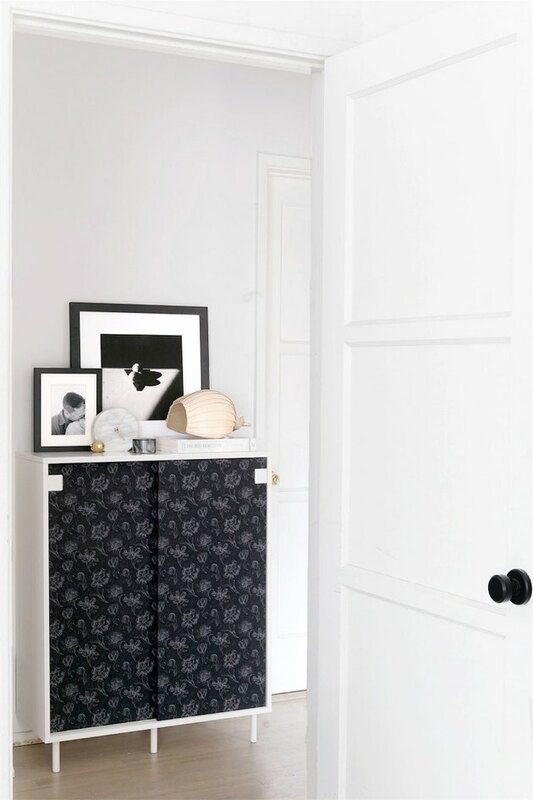 Ikea's much-beloved Hemnes dresser ( $279 ) gets some geometric flair with this simple removable wallpaper hack from Stephanie Stanesby over at Homedit. And colorful new hardware gives this storage unit a little extra charm. 5. Revamp Bekväm step stools with a pop of color. Are you blessed with tall cabinetry? Yay for the storage space — but boo for struggling to reach your spices. If pulling your culinary secret weapon out of the kitchen cabinet requires a step stool, at least make it colorful one. 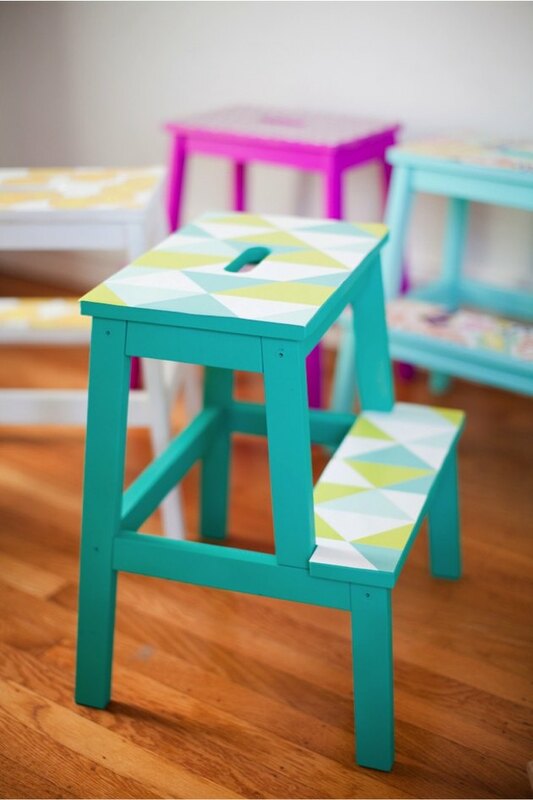 Audrey over at This Little Street not only added a bit of color, but she also added playful patterns to Ikea's Bekväm step stools ( $19.99 ) using some bright paint and removable wallpaper from Spoonflower. 6. 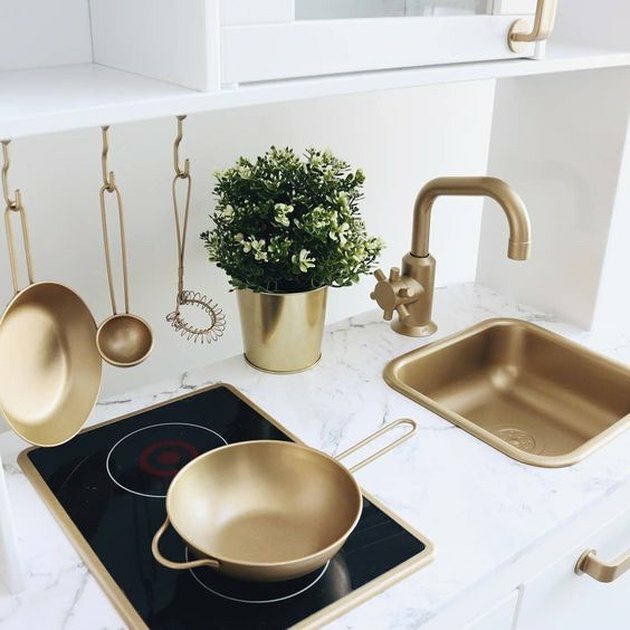 Give your little one's Duktig kitchen the glam treatment. Ikea's Duktig play kitchen ( $79 ) may feel a little bland, especially if your mini-me loves glamour as much as you do. Upgrade your kiddo's play space with some marble-effect removable wallpaper and gold spray paint like Nina from Judgy Mummy did with this gorg Ikea hack. 7. Make your Vittsjö shelving unit shine. Looking for a place to show off your most beautiful tchotchkes? 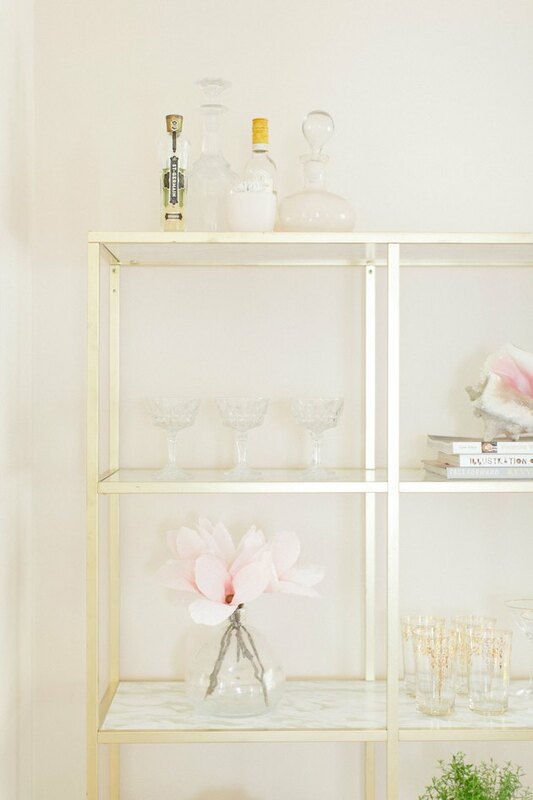 Follow Jacquelyn Clark's lead and transform Ikea's Vittsjö ( $79.99 ) into a gorgeous shelving unit, perfect for displaying glass vases and delicate pink peonies. 8. Time to give your china cabinet a classy facelift. Looking to add a glamorous-but-moody effect to your dining room? 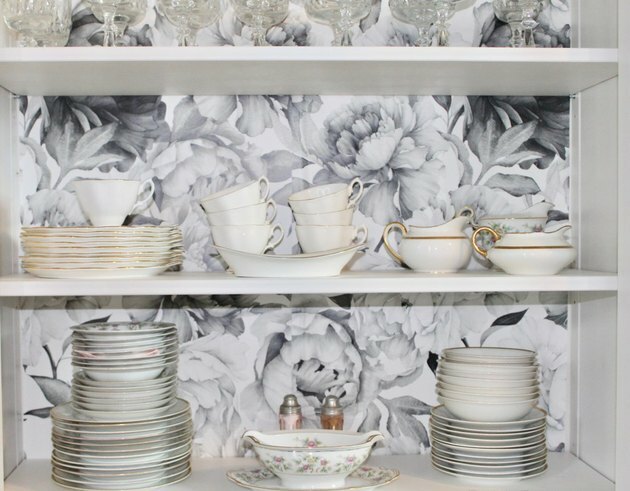 Follow Tonya's the instructions at Hey There Delyla to give your boring china cabinet a dramatic makeover by adding some removable wallpaper. 9. 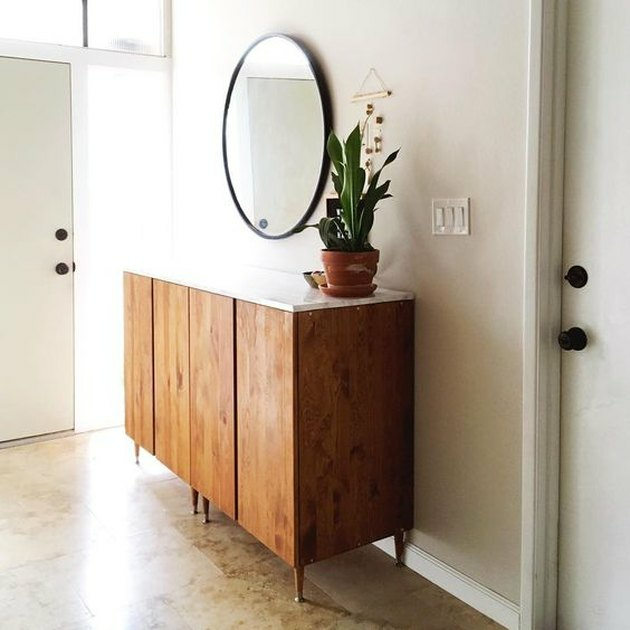 Transform an Ivar cabinet into midcentury gold. These plain Ivar cabinets ( $70 ) from Ikea get a dramatic upgrade thanks to Elise Joy and a simple piece of plywood — of course, covered with removable marble wallpaper — and tapered legs. Choose a simple pattern for an unobtrusive (but still gorgeous) effect. 10. Draw attention to the Billy bookcase with bright hues and playful patterns. Use bold colors to play up the fun patterns found in removable wallpaper. 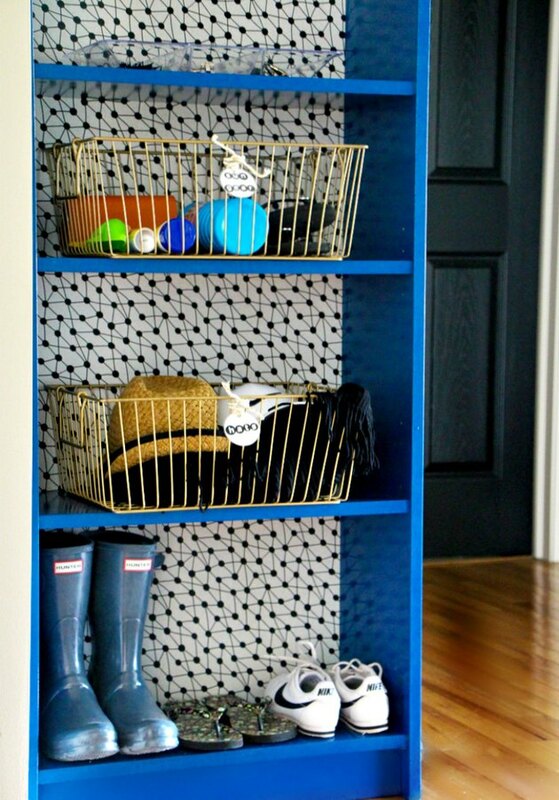 In this Ikea hack, Rachael from This Is Our Bliss transformed the Billy bookcase ( $79 ) by painting it a bright, royal blue and lining the back with a playful line-and-dot pattern wallpaper from Tempaper. 11. Give the Sundvik table a marble makeover. Tia and Shauna from Studio Meld gave Ikea's adorable Sundvik table for kids ( $39.99 ) a chic marble upgrade. Using removable wallpaper from Wall Pops!, this little white furniture set went from drab to fab in less than 20 minutes.